Clear to maintain greenhouse humidity and temperature for healthier seedlings. Reusable, made from recyclable plastic. Will fit Jiffy plant trays Numbers 234 and 236. Make Starting and Handling Plants Fast and Easy. Bottom Holes Improve Root Development and Afford Better Drainage For Your Plants. Help To Minimize Shock When Transplanting. Ideal For Starting Plants, Especially When Handled In Trays. Easy To Fill and Easy To Break Apart When Ready For Transplanting. 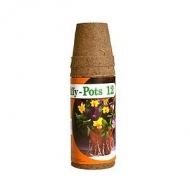 Growing In Jiffy Pots Eliminates Root Spiraling and Transplant Shock. Plant Pot Directly Into Your Garden. 11 x 22, Recyclable Base Tray, Features Biodegradable Jiffy Strips To Start 32 Plants The Healthy Natural Way. Professional quality mix of peat moss and vermiculite is ideal for starting seeds and to root cuttings. Lightweight composition for easy handling.